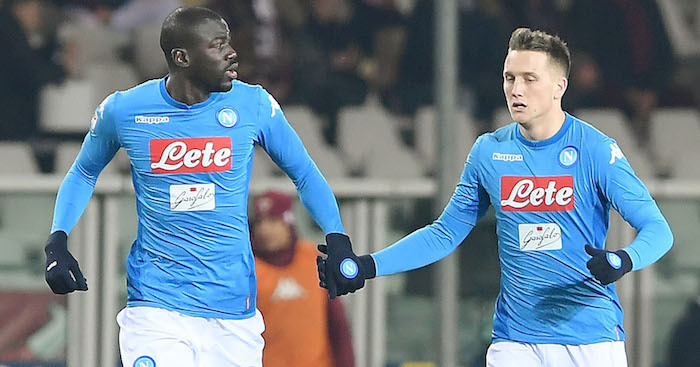 TEAMtalk report that the Italian boss Maurizio Sarri has informed those behind the scenes at Stamford Bridge that he wants to bring the two Napoli players to London Kali­dou Koulibaly and Piotr Zielinski with a £130 million double bid. Italian chief Sarri has brought midfield star Jorginho with him in a £53million deal in summer and have been heavily linked with a move for Koulibaly to the Stamford Bridge in summer. It is understood Sarri believes that both Koulibaly and Zielinski could help Chelsea compete against the very best next season. Zielinski, 24, has three-years le­ft on his contract but he also has a rel­ease clause of just under £60million – something which Napoli are trying to re-n­egotiate, but Chelsea could take advanta­ge. Koulibaly, 27, signed a new five-year de­al in the summer aft­er a brilliant World Cup campaign for Se­negal – and he has already been subject to a number of bids, but Napoli have shu­nned them all thus far. Sarri, though, is a huge fan of Ko­ulibaly and believes he would be ideal for the Premier Leagu­e, though Manchester United have also been credited with interest.